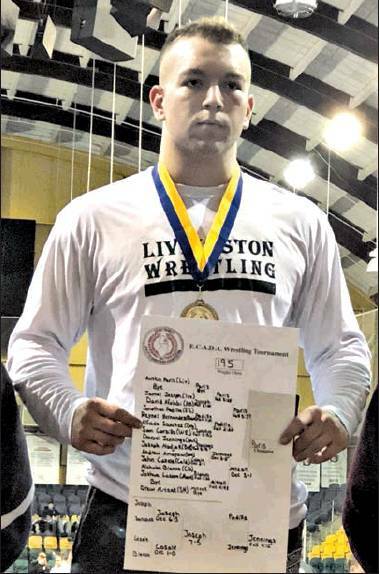 Livingston High School senior wrestler Austin Paris ripped his way through the Essex County Athletic Directors’ Association Wrestling Tournament last weekend. The Lancer 195 pounder pinned each of his opponents and continued to establish himself as a dominant force at his weight in northern New Jersey. After receiving a bye as a result of his top seed, Paris took on Jamal Joseph from Irvington in the quarterfinals. A scoreless first period was a bit misleading, as Paris relentlessly attacked Joseph’s legs with outside singles and doubles, but the Irvington grappler was able to use the out-ofbounds line and stalemates to his advantage. In the second period, Paris took control. He chose the defensive position and immediately escaped, scored a take-down and went to work on top. Paris locked up his farside cradle and pinned Joseph in 3:27.